A cute and quick childhood quilt from Lunch Box Quilts done in the hoop. This one caught my eye because of the possibilities with the design. Little guys are crazy for them dinosaurs. Turns out little girls are too. We will stitch a few of the blocks together in class and go over assembly tips and tricks. Class includes the design at a discounted price and 8 background blocks to get you stitching. 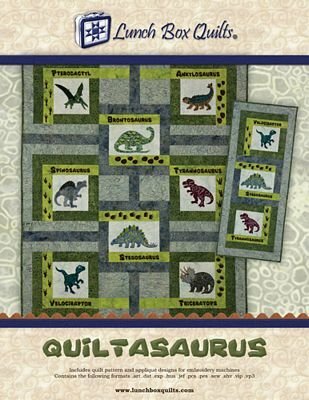 We will also have a pile of fabrics available to create those applique dinosaurs from. You will be responsible for the choosing and purchase of background, sashing and finishing fabrics for the quilt.